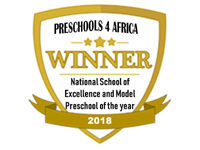 Each week classes are taught according to a theme which is developed to stimulate the intellect, memory, social skills, communication skills, vocabulary, speech, and fine and gross motor skills. The teachers have an assistant teacher to help with classroom and playground activities and to attend to the individual needs of the child. Children play in a well established safe play area. Teachers and staff are constantly present with the children whilst they play. Children play in the playground according to their ages groups. There are numerous outdoor activities for the children. The various jungle gyms, slides, swings, bike tracks, trampoline, Wendy house and shaded sand pit give the children a variety of activities to choose from during their play sessions. All teachers are qualified and competent in administering first aid. The school is open every day of the year with the exception of public holidays and December. The school operates according to Government School Terms.